Barricades are everywhere. The air is thick with smoke and the smell of fuel, as hundreds of braziers warm tired crowds camped in the streets. What you are reading is not a scene from a sci-fi movie about a post-nuclear, holocaust world. This is Kyiv and the new Maidan. For the second time in a decade, Viktor Yanukovych has united his fellow Ukrainians against him in thousands of protest actions across the country. The first time he managed such a feat was back in 2004, when the then-PM was presented as the candidate from Ukraine’s largest oligarchic clan (this despite his two convictions of violent robbery). A rigged ‘victory’ in the run-off with opposition candidate Viktor Yushchenko triggered the events that came to be known as the Orange Revolution. These events should have scuppered Yanukovych’s political career for good. Constant infighting in the Yushchenko team, however, allowed Yanukovych back in. After victory at the next presidential election in 2010, it took him only a few months to turn his country into an authoritarian state (and make his son one of its wealthiest citizens in the process). Less than four years later, Ukrainians had had enough; the U-turn on the Association Agreement was the last straw. 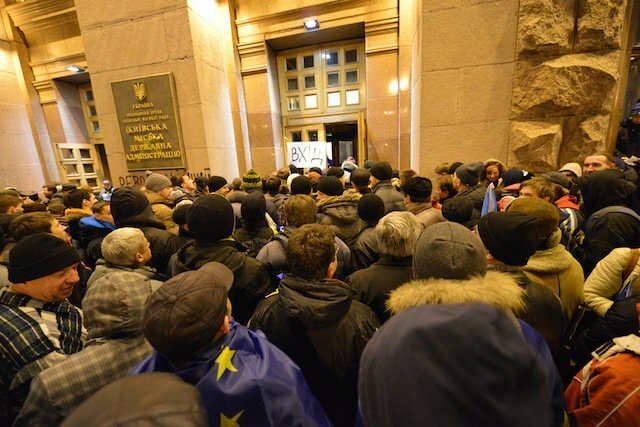 Protests calling for Yanukovych to sign the EU association Agreement began two weeks ago, on the eve of the Vilnius summit. After the debacle of Vilnius, the number of demonstrators actually began to tail off as expectations gave way to disillusionment. It was only when riot police used brutal violence to disperse demonstrators on 30 November that the protests were given a real lease of life. Photos of young people with blood pouring from their wounds, and video footage of riot police kicking journalists lying down on the road, brought half a million Kyivites out onto the streets. 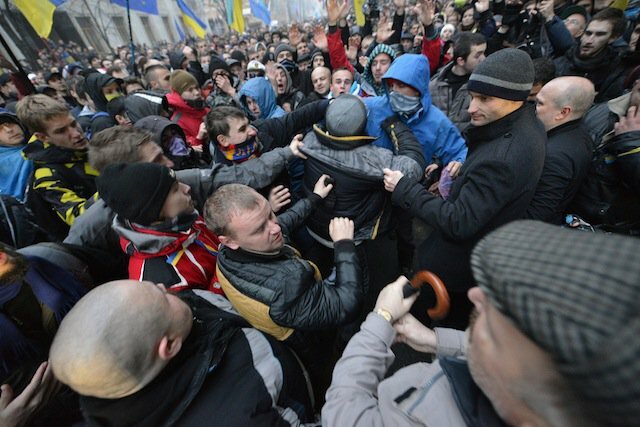 Tens of thousands occupied the city’s central Independence Square to demand Yanukovych’s resignation. Tents appeared in the square and the protesters seized the City Hall and Trade Unions House — another government building — where they set up first aid posts, canteens and dormitories. The scenes are like a re-run of the Orange revolution in 2004. Today’s scenes are unquestionably reminiscent of the Orange revolution in 2004. You can see young women moving through the demonstrators with trays of sandwiches, and cries of ‘hot tea’ ring piercing through the air as the ‘revolutionaries’ line up for a warming drink. The protest has no lack of support from Kyivites. Thousands of people are turning up at the protest encampment with money, food, warm clothing and fuel. The chat is friendly, but inevitably turns to the topic of how to overthrow the president. From time to time, someone calls for the storming of his luxury residence in Mezhyhirya — I reported aboout it on these pages — which remains one of the most enduring symbols of blatant government corruption (not every president needs an ostrich sanctury and eighteen hole golf course, after all). The only things stopping the protesters are the distance from central Kyiv and the thousands of troops stationed there. Visitors to Ukraine’s top online media resource reached 800,000 a day. On a positive note, the 2013 Maidan protest has been an absolute triumph for Ukraine’s internet and social media. Euromaidan’s Facebook page has made 130,000 new ‘friends’ in the last two weeks. An online TV channel, hromadske.tv, staffed by journalists fired by the official media for their independent views, has provided a reliable 24-hour alternative to the pro-government news stations. At the peak of the events, the number of visitors to ‘Ukrainskaya Pravda’, Ukraine’s top online media resource, reached 800,000 a day. This came despite constant DDoS attacks and the creation of clone sites. Whether he understands it or not, Yanukovych is clearly living through the deepest political crisis of his presidency. A short while after the police violence on Saturday, Serhiy Levochkin, his head of his administration and a leading figure in the ruling Party of Regions, tendered his resignation. Levochkin's wife even posted a drawing of a Christmas tree covered in blood on social networks, in apparent the explanation of the attack offered by the authorities, i.e. the need to install a huge festive tree in a square occupied by protestors. The mutiny in the Yanukovych ranks proved short-lived. The opposition in turn forced a parliamentary vote of no confidence in the present administration, which is led by pro-Russian reactionary Mykola Azarov. The authorities took no risks, stationing more than a thousand special forces troops around the parliament building and blocking access points with dozens of police buses. In the end, there was no storming of the building by protestors; and since only 186 MPs out of a necessary 226 voted for the dissolution of parliament, there was no political breakthrough happen either. The mutiny in the Yanukovych ranks also proved short-lived: Levochkin remained in post, and the faction he controls did not cross the floor to support the opposition. His ‘brave protest’ was, in effect, reduced to little more than a PR stunt designed to deflect the increasing waves of hostility from the west. The leading opposition figure and reigning world heavyweight boxing champion Vitaly Klychko meanwhile pinned the responsibility of ‘blood spilt on the Maidan’ on Yanukovych and the Communist Party. As a fairly inexperienced politician, Klychko sometimes has difficulties with public speaking, but the Euromaidan has provided him with an ideal opportunity to declare his candidature for the next presidential election in 2015. He’s already ahead of Yanukovych in the polls, although the government has put a spanner in the works by hastily passing a law to disqualify him from standing since his main country of residence is now Germany, not Ukraine. Another opposition leader, Arseny Yatseniuk, is calling for a snap election. Yatseniuk, an ex- Bank of Ukraine head and Foreign Affairs Minister, leads the party bloc formerly led by Yulia Tymoshenko, who is serving a seven year prison sentence on charges initiated by Yanukovych soon after he came to power. For many years Yatseniuk was regarded as a man with a future, but his popularity with the public isn’t helped by a total lack of charisma. A united opposition front candidate is bound to beat Yanukovych. The only effective strategy for the opposition would be to agree on a single presidential candidate, whether that election should take place now or in 2015. The strategy worked in 2004, when the Orange Revolution brought to power a democratic government under the presidency of Yushchenko. And it is what the present government fears most, since a united opposition front candidate is bound to beat Yanukovych. 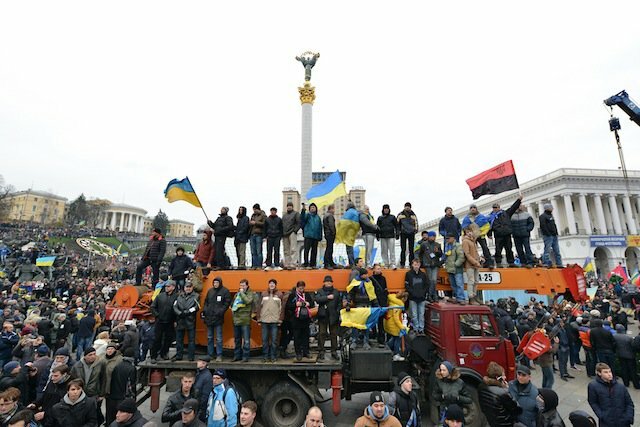 The other thing about the Maidan now is that the political opposition is not in complete control of the popular protest, and in fact is often unclear about what to do next. The latest example of this was Yatseniuk’s call to the opposition to block the presidential administration’s operations after the unsuccessful no confidence vote, when in fact it was well known that Yanukovych had left the country on a visit to China. Who was to blame? And what is to be done? The question that still bothers many people in Kyiv is why the regime resorted to a police attack on protestors last Saturday. A lot of people believe that the man behind it was the secretary of Ukraine’s National Security and Defence Council, Andriy Klyuyev, who is close to the Kremlin’s behind-the-scenes man in Kyiv, Viktor Medvedchuk. One popular theory suggests that the bloody violence was a KGB-style ‘special operation’ to make the west drop their designs on Yanukovych and leave him a hostage to Russia. But given Ukraine’s Putinesque power vertical, it’s highly unlikely that the police would have behaved as they did without Yanukovych’s explicit blessing. It’s highly unlikely that the police would have behaved as they did without Yanukovych’s explicit blessing. One prominent politician who has kept very quiet during all this popular unrest is another Party of Regions leader and former business partner of Yanukovych, the Donetsk oligarch Rinat Akhmetov. This man, whose fortune is estimated at $18 billion, controls a third of the PoR faction in parliament. On the other hand, none of his associates have condemned the police violence at the Euromaidan or expressed any support for the opposition. As the second unspoken shareholder of the ruling party, Akhmetov received many privileges after Yanukovych’s victory in 2010, putting his managers into important government posts and acquiring a number energy companies on dodgy tenders during privatisation. [Rinat] Akhmetov exercises no less influence of the Party of Regions and is much more susceptible to international sanctions. Akhmetov is persona non grata in the USA, but has put down roots in the UK. His family lives in London, and he himself owns the most expensive apartment in the world at No.1 Hyde Park. Here he receives credit for the development of his businesses, and spends enormous sums on shoring up his reputation. So the west, which hasn’t been able to persuade Yanukovych to play by the rules, should start to work with Akhmetov as well: he exercises no less influence of the Party of Regions and is much more susceptible to the international sanctions that the head of Freedom House David Kramer is openly calling for. Today, with the Euromaidan gathering strength but the regime still deaf to the public’s demands, it’s the right moment for the west to take the initiative to find the way out of this impasse. Just as in 2004, the president and the opposition need to sit down together for talks, with European and American politicians in the role of guarantors. A similar role has recently been played by former Polish President Alexander Kwasniewski and ex-European Parliament President Pat Cox, who visited Kyiv 25 times in the last eighteen months. Unfortunately they are now weakened and discredited by the failure of their attempts to have Yulia Tymoshenko released and have the EU Association agreement signed. A new mission should consist of active politicians and should work to a much shorter timeframe, and their mandate should include not just a peaceful solution to the present crisis but a guarantee of a fair and free presidential election in 2015. It will probably only be after this election that Ukraine will be able to sign its Association Agreement with the European Union.